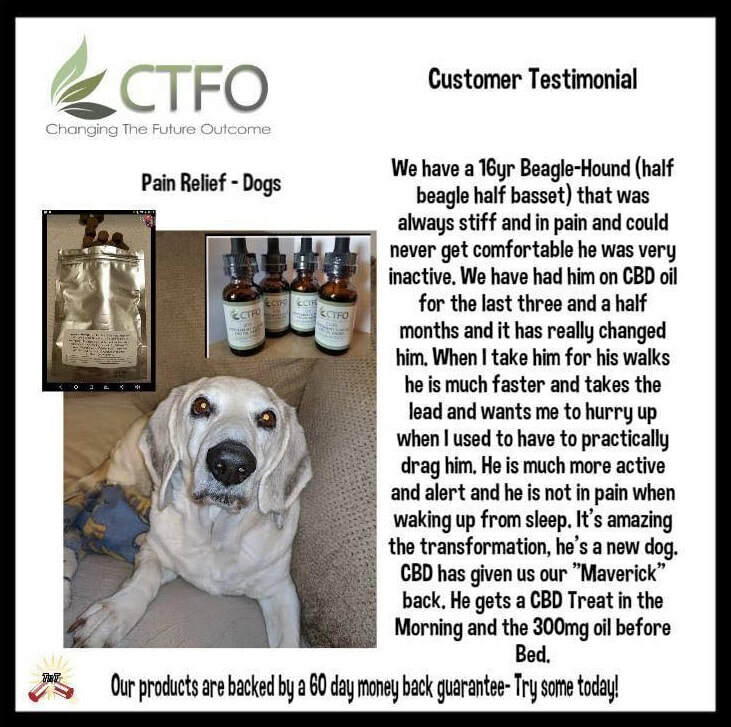 All testimonials are 100% true and come straight from our CTFO CBD Oil testimonial group on Facebook. Our Toby has anxiety issues some times. He gets whinny, he anxiously starts picking up little items on the road and/or carpet and eats them, and he has trouble settling down! Toby was having a anxiety today. 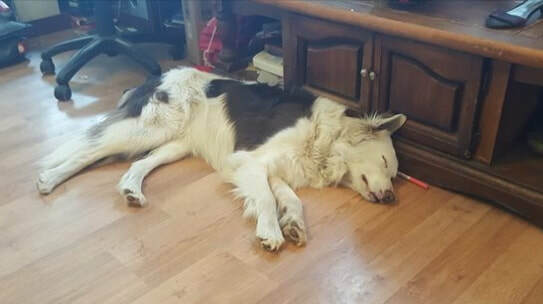 About a half hour after I gave him CTFO CBD oil, he settled down with in minutes of us giving him CBD oil and he his a lot happier and settled boy! We feel so blessed to have this awesome product to help our fur babies and ourselves to feel better! I also have the pet oral spray on hand if he starts chewing his feet. Not every day, but it's nice to have on hand. We have a 6 year old Great Dane. The normal life span for a Great Dane is 6-8 years, so our girl is getting up there. 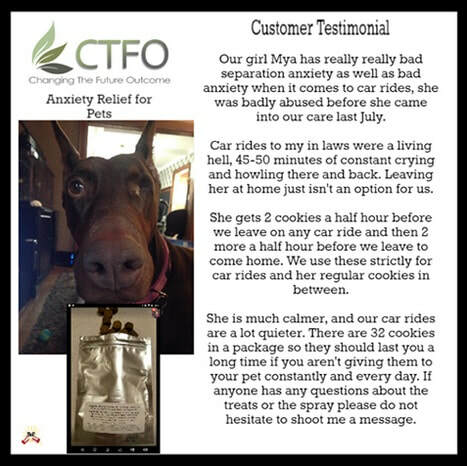 Her health is great, but lately she's been showing signs of being stiff and sore, so we got the CTFO dog treats to give to her a couple of weeks ago. We've been giving her 2 a day. Last week, we went out of town for 4 days, and boarded her at my wife's veterinary clinic while we were gone. They continued giving her the treats. When she came home yesterday, she ran around the yard like a young dog - she was keeping up with our 8 month old Great Dane! My dog Moe has been in hospital for arthritis and the Back problems of weiner dogs , well he wasn’t able to even walk yesterday and today he’s up and moving !!! 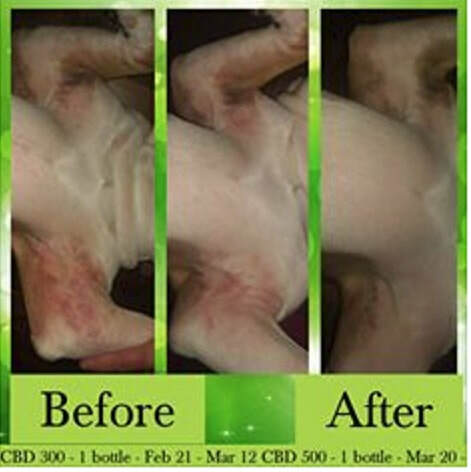 He has literally had 2 sprays of the CTFO pet wellness spray .. living the pet product so far !! He is not having the pain he was having , as he’s not whining like he was before!! Piglet is taking 1 drop of CTFO 750 every 12 hours (after about 10 days of figuring out her dosage) for her 3 compressed discs. As you can see, on her neck and chest she has a huge lipoma (fatty tumor , always benign )... less then one month on CTFO CBD and her lipoma is shrinking. 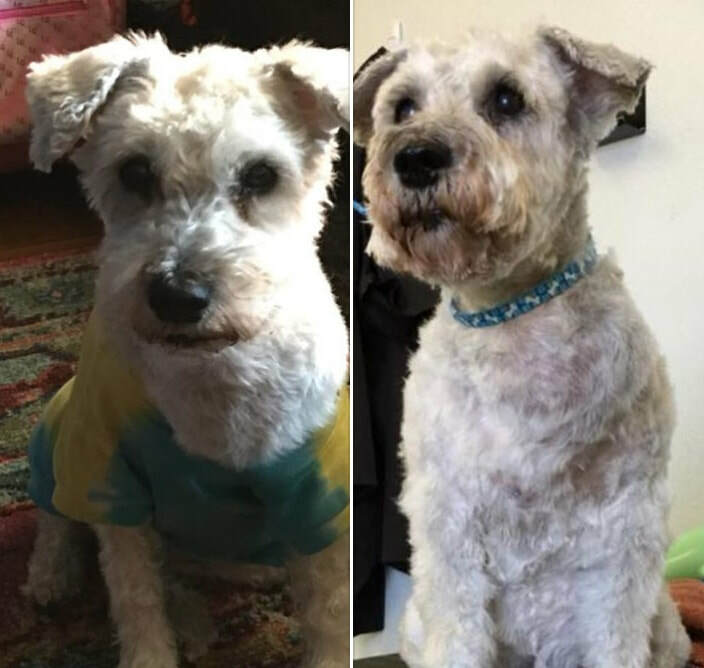 She has a little more fur on the before pic but not that much more. The after pic is today while being dried at the groomer. I would say that’s pretty amazing ! So here's a pic of my baby dog sleeping and resting on his own! He gets 5 drops twice a day on his food of the CTFO 300mg oil. He is still a hyper pup as he's only 2yrs old but now he will relax and rest on his own. This may be an early testimony but I'm too excited not to share! My husband and I have experienced for ourselves the benefits of CBD products that CTFO offers with our own health issues. However, I'm even MORE excited with how it's helping our fur baby, Nutmeg. It started about 3 or 4 months ago. Our 9 year old dog went from a healthy dog to one that would vomit or have diarrhea each time she ate. We tried her on different types of dog food with the same luck. Also whenever she did eat she would have the most foul smelling gas and her stomach would make horrible sounding noises. We took her to the vet and had blood tests and other tests done... and besides the massive weight loss the vet didnt understand what was going on because she still looked so healthy. We tried different medications and nothing worked. Nutmeg went from having little bit of an appetite to none at all... she would go days without eating and when she did finally eat, it would all come back out. We took her back to the vet last week where she had urine extracted from her bladder (the vet is now assuming possible liver disease) and she was given a b12 shot. We were told if she didn't start eating, we might need to start to consider putting her down. This was heart breaking because Nutmeg is the sweetest and friendliest dog ever. Having three boys of our own and having multiple other kids here daily since I have a home daycare; she LOVES kids and despite being sick she is so gentle and patient with them. 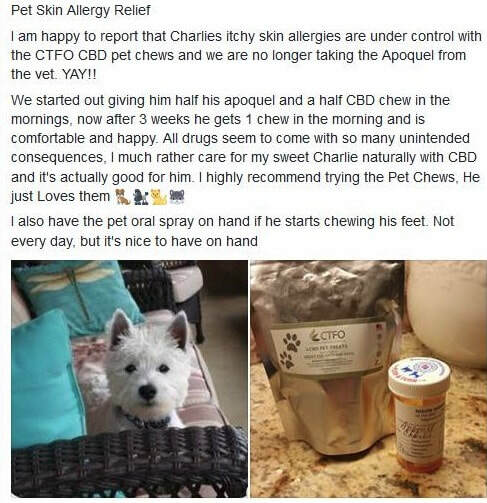 We got the go a head from her vet to start giving her the CBD Pet Oral spray and holistic dog food. Literally not even 10 minutes after giving her the spray SHE STARTED EATING! We weren't sure if it was the CBD or the B12 shot that gave her an appetite but we were ecstatic! She isn't out of the woods yet but I swear shes beginning to gain weight and our happy energetic dog is starting to come back. I have a bottle calf who got a hurt leg a round bail had rolled on to his back leg. He is a little bruised and some swelling no breaks. Have a little bottle calf with a hurt leg some swelling so he is getting Doctered up and the special treatment. I gave him 4 drops of the 500mg CBD Oil to help with pain and swelling last night at around 12am. went out for his 6 am feeding and swelling had gone down and he was able to put more pressure on it. He got up with a couple trys, drank his full am bottle. Was trying to play but still a little weak on his leg. 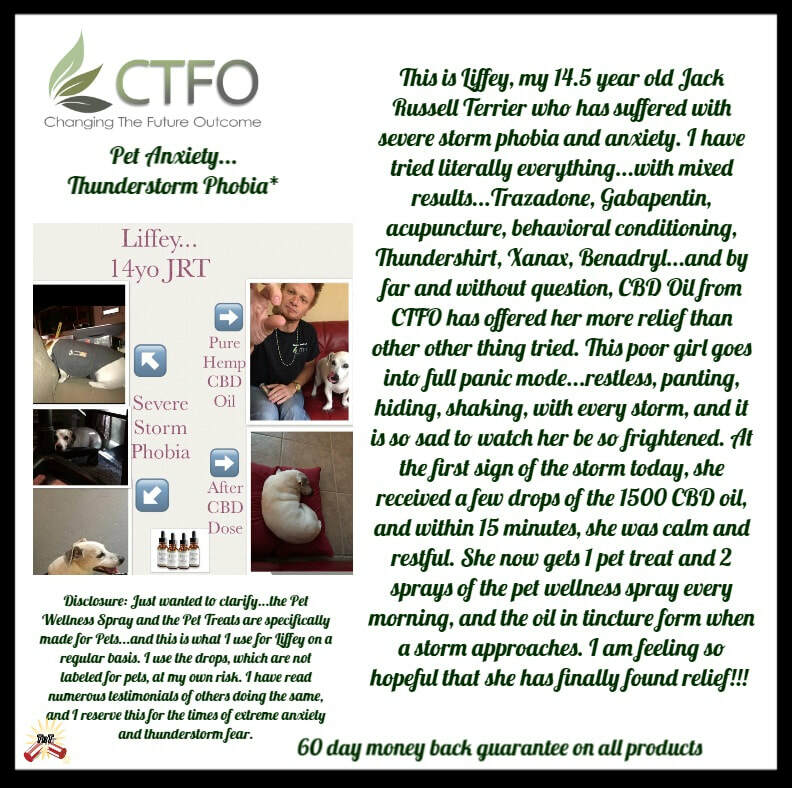 CTFO CBD to the rescue on the farm :)..
Doggy Head tremors gone !!!!!! Meeko our Black Lab who is now 10 started having idiopathic head tremors this means her head shakes uncontrollably she would also nearly fall over. 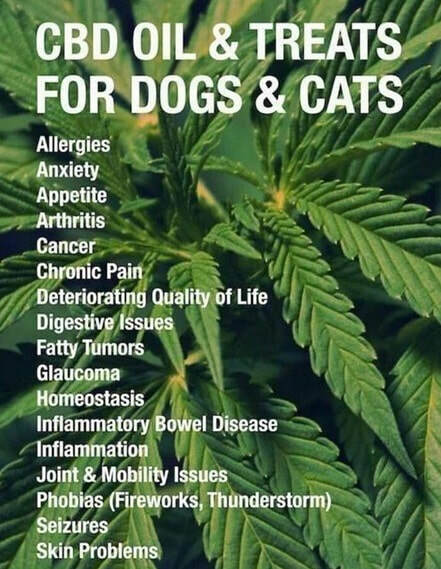 NOT ANYMORE thank you CTFO for CBD Pet treats only 2 treats a day and they are gone!!! On behalf of my dog Bexley! Rash is clearing up nicely. Still itchy so moved to CBD Oil 500 to see how that goes. This was my Sophia just before we started giving her one dose a day of CBD oil. She was having little seizures called - Fly Biting . After only 3 days she stopped completely. We have been using CBD oil now for 7 weeks.